Here is a treasure: an adult novel which speaks in the genuine voice of a 17-year old, while delving more deeply into her psyche. Lesley's Hungarian mother Mara - charming, childlike, lovable - was traumatized by her adolescent Holocaust experiences. Though her American husband and daughters try to live a normal life in Kansas, Mara holds them thrall to her moods and quirks. Lesley struggles to understand, but dealing with Mara is a severe strain which sets her apart from her peers. When Mara's psychosis results in tragedy, Lesley goes to Wales in search of her mother's remembered joy, a sunflower forest. When Torey was visiting friends in Wales in 1980, she was sitting in front of the fire in their stone cottage and waiting for the tea to brew when she picked up the local paper and saw an article about a local woman who had been part of the Nazi Lebensborn program in World War II. She wrote her agent that night that she "had been gripped by an idea". It never left her and four years later, THE SUNFLOWER FOREST was the result. Torey used the setting around her friends' cottage as the Welsh location. 'Mara', the main character in THE SUNFLOWER FOREST, is not based on a real person but is simply someone Torey created in order to explore the issues of generational trauma. 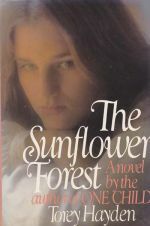 Torey says she isn't sure whether to be flattered or insulted by the fact that often readers and even reviewers of THE SUNFLOWER FOREST refused to believe Mara was imaginary.